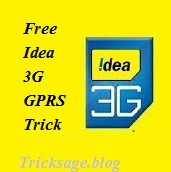 This time Tricksage.blog posting a new and latest 2G/3G Gprs trick for all Idea user , and ya thanks for the previous trick we get all your support and this support boost us to provide better tricks to you, and as this Idea free Gprs works on P.C. , laptop and Android and this Idea UDP 53 trick is based on PD proxy VPN. and this trick is working fine in two circles and we hope it will work at yours place too. First Download PD-Proxy-VPN -by Clicking Here . Then Feed 9201 in UDP server and blind local port as shown below in screenshot. Now simply connect it you done. Try at low balance to avoid deductions. comment about its working at your place.